This month I will present a case in which removal of a separated instrument was performed. The patient is a 41 y.o. male who presented with the chief complaint of swelling and pain associated with tooth #30. His medical history revealed a positive entry for high blood pressure which was well-controlled with Amlodipine and for tobacco use. His dental history associated with tooth #30 was as follows. He had pain approximately 1 year ago and had root canal therapy performed. 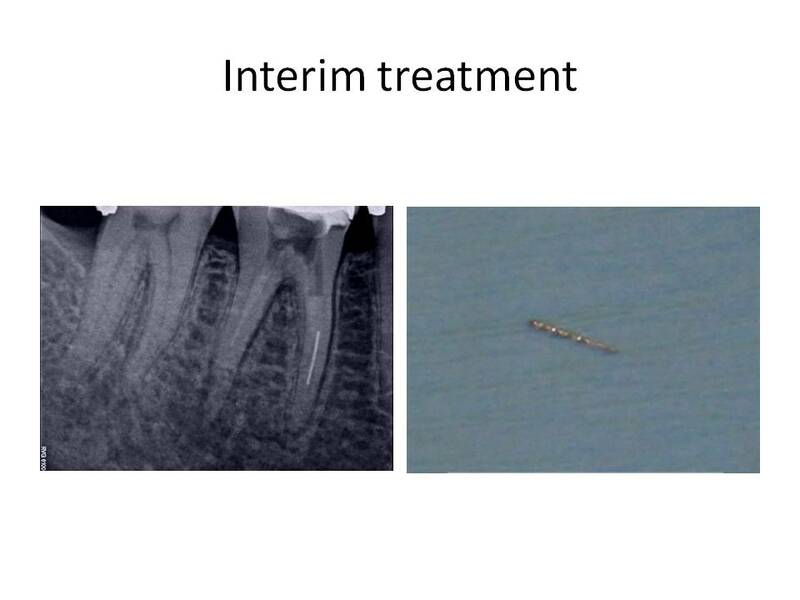 At the time of the treatment, the patient was informed of a separated instrument in one canal and assured that the tooth would be fine. Treatment was completed and a crn was placed on the tooth. Approximately 2 weeks before he presented to my office, he experienced swelling on the right side of his mandible. He was being treated for a sinus infection at the same time and was taking antibiotics. He noted that the swelling had resolved and his pain was also reduced. Clinical exam #30 reveals PFM crn present, perio pocketing was noted DL and DB of 5-6mm, tenderness to percussion and expansion of the buccal cortical plate was noted. 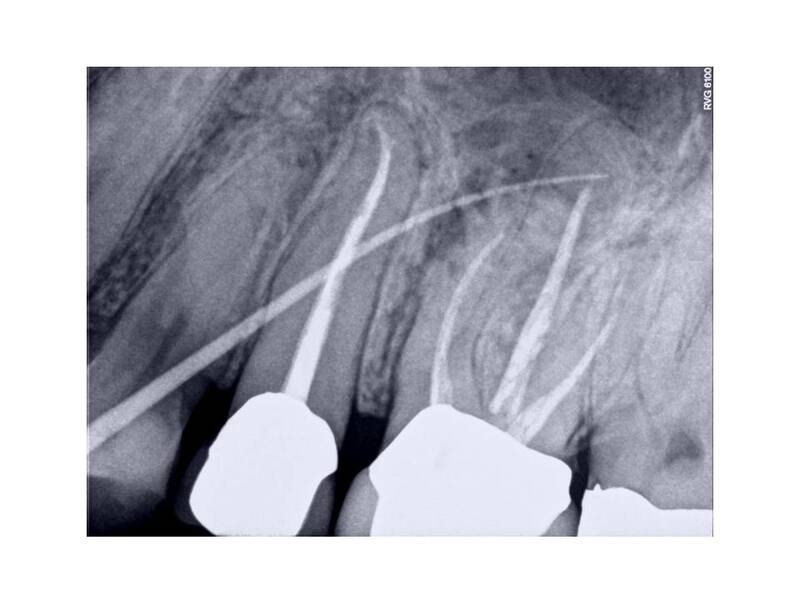 Radiographically, RCT was done and the tooth was instrumented and obturated well short of the radiographic apex in all canals, RL lesion was associated with the Distal root, and a separated file was present mid-root in the MB canal. The crn also appears to be ill-fitting with an open mesial margin. The clinical diagnosis is Previously treated #30 with symptomatic periradicular pedoni. 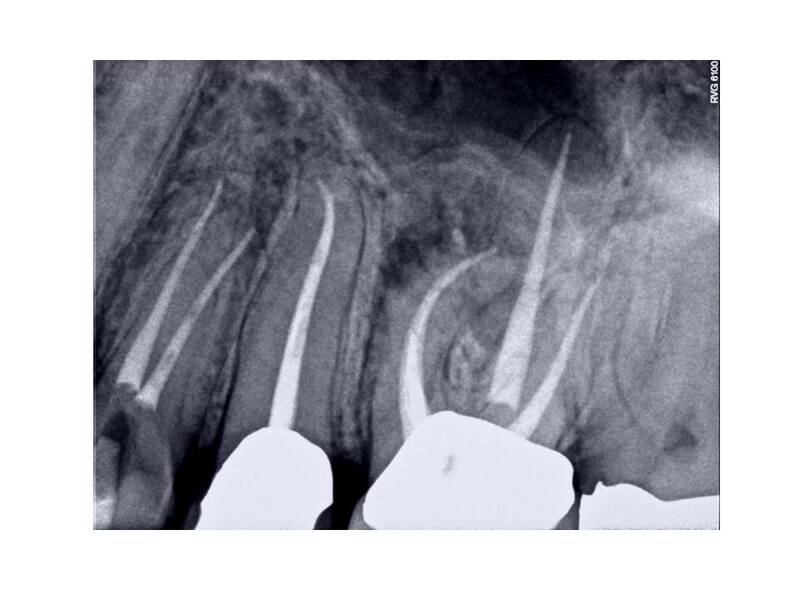 The recommended treatment was non-surgical retreatment with the added provision that the removal of the separated instrument will be attempted in order to completely instrument the canals. The goal of the first appointment was to remove the previous obturation material and begin the instrument removal process. 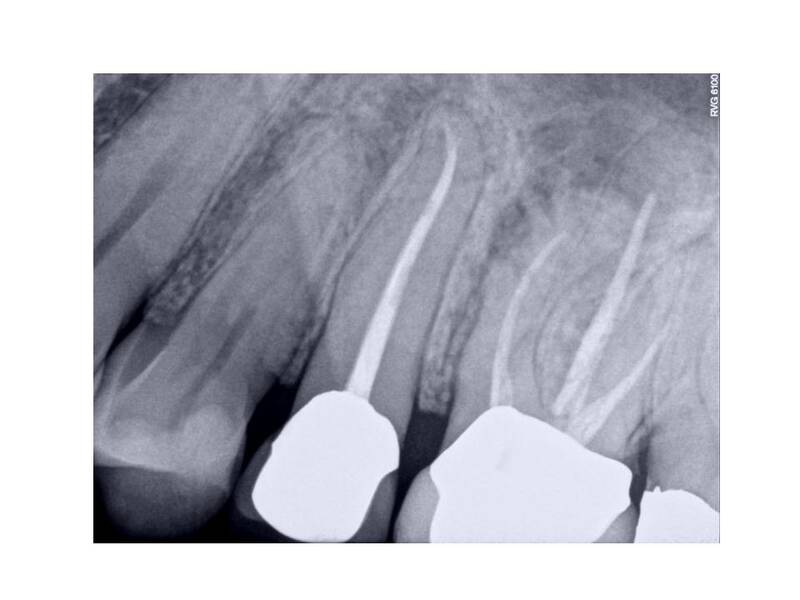 After removal of the Gutta Percha, calcium hydroxide was placed as an interim medicament. The second appointment consisted of continuing the attempt at removal of the instrument, but to no avail. However, the canals that were accessable, were cleaned and shaped to length. The ML canal was blocked and had to be negotiated to length. At the third appointment, the instrument was finally loosened and removed form the tooth. The case was finished and the patient was instructed that a new crn was indicated due to the open mesial margin. The difficulties in this case were two-fold. First, the canals that were instrumented were blocked and inadequately cleaned and shaped. The second problem was of course the separated instrument. The removal of broken files is dependent on several factors: 1. Location – the higher up in the root, the liklihood of removal is increased, 2. If the fragment is not around a bend which would restrict straight-line visualization of the instrument and 3. The amount of root structure that would remain after instrument removal. The technique involves the use of ultrasonic tips, platforming to visualize the instrument, the use of a surgical operating microscope and finally, and most importantly, PATIENCE! I welcome all comments or questions. Thank you for continuing to trust in our practice. We wish to be your first choice in endodontic care for your patients. 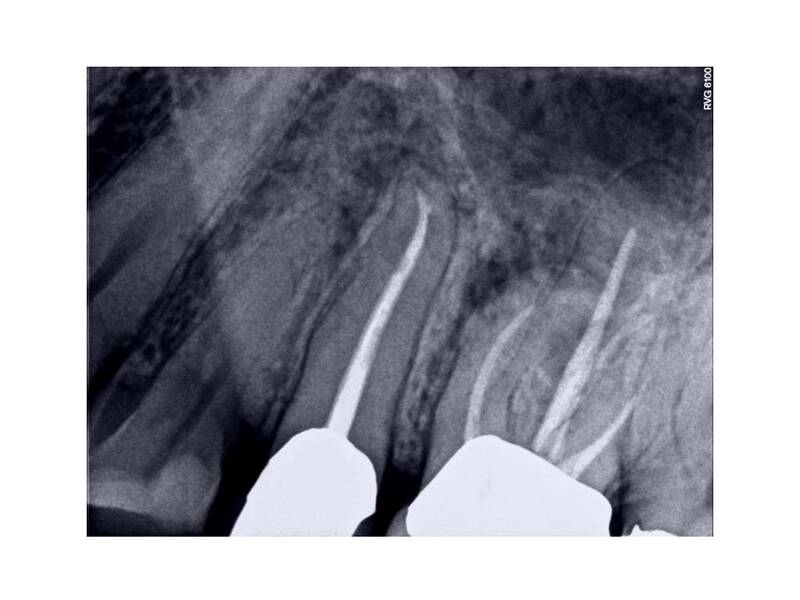 This month’s entry is an interesting case that had a different approach to treatment. Initial exam revealed that patient’s health history was unremarkable. Clinical exam: Large DOL composite present #14. Occlusal composite #15, no restorations #12,13. Pulp vitality tests revealed no response to cold #12-14. Tooth #15 responded WNL, Slight percussion tenderness present #14 only. Perio and palpation was WNL #12-15. Evaluated occlusion and hyperocclusion was noted DL cusp #14. Radiographs reveal restoration #14 approximated pulp chamber, otherwise periradicular tissues appeared WNL. The occlusion was adjusted and the patient stated that his bite felt normal again. He was asked to return if his symptoms returned or did not improve. 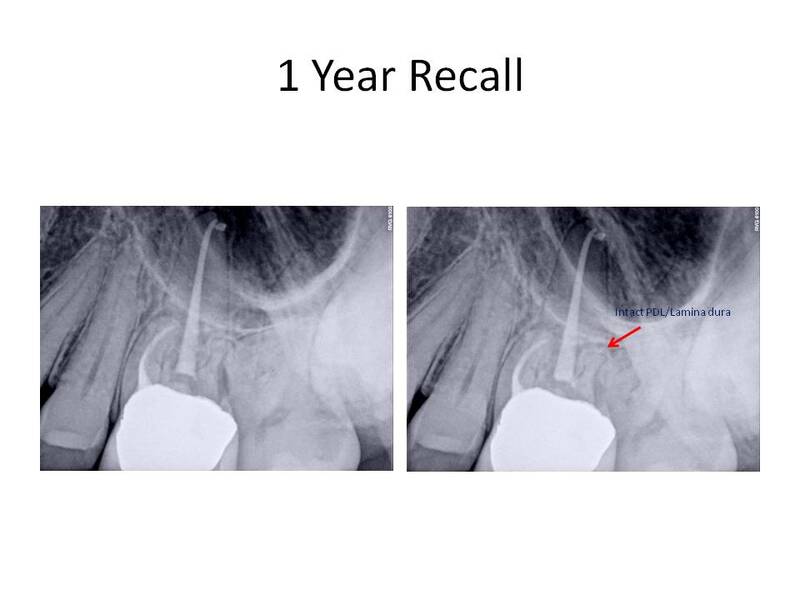 One year later, the patient returned with CC of, ” I have had more pain in the past month and I have decided to have it fixed.” Clinical exam revealed that there was a sinus tract stoma present facial to #14, puip tests were the same as last time for teeth #12-15. 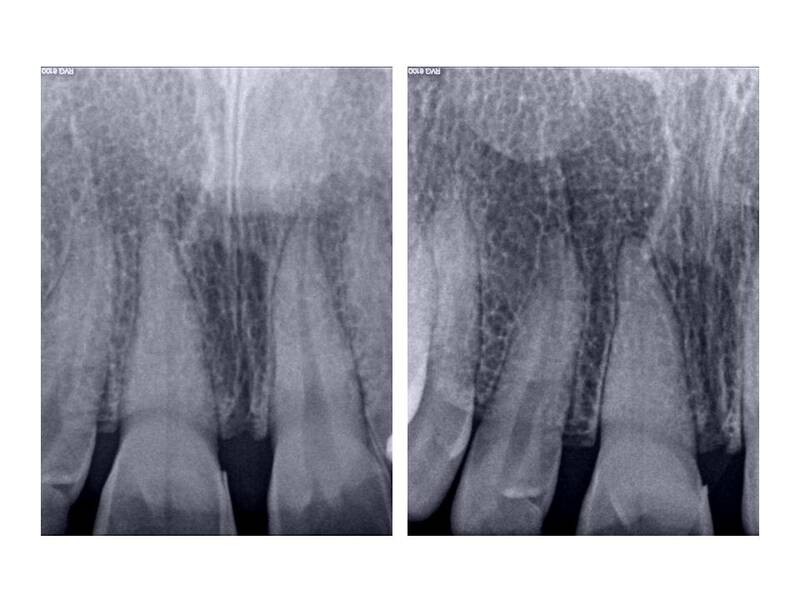 Radiographs revealed RL lesions associated with the MB and P roots #14 and external resorption of the DB root. Diagnosis was Pulpal necrosis #14 with chronic periradicular abscess. 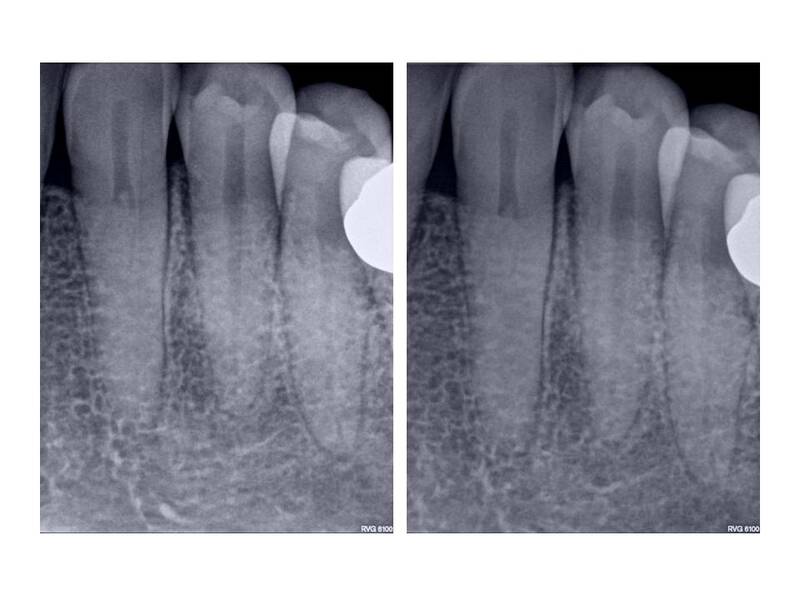 External resorption of the DB root. Treatment was as follows. 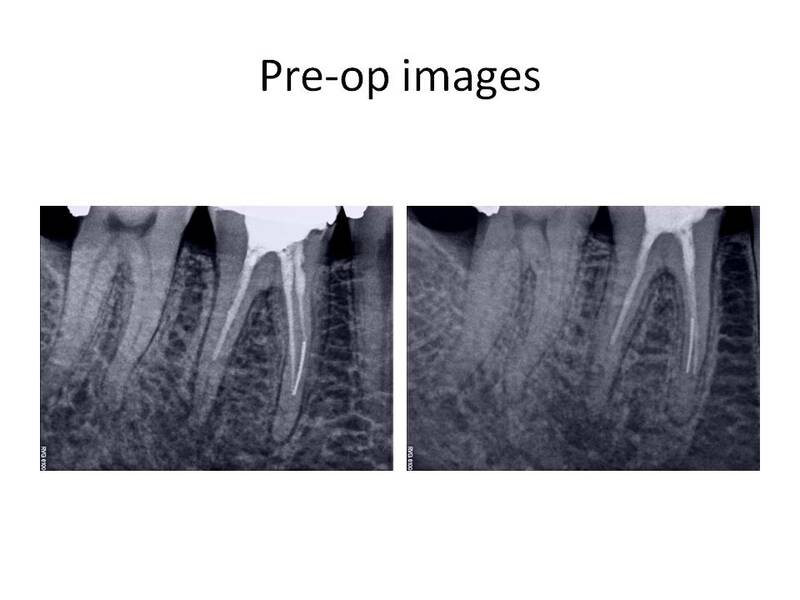 Traditional non-surgical root canal therapy of all three roots and obturation of the P and MB with GP/sealer. 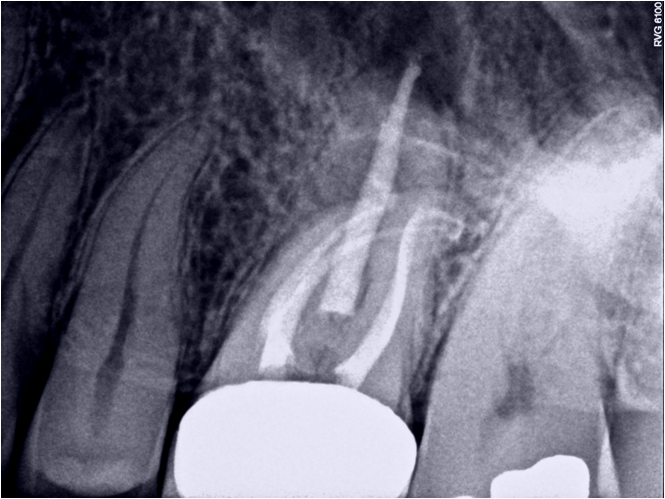 The DB canal was obturated with MTA to facilitate DB root resection and address the external resorption. 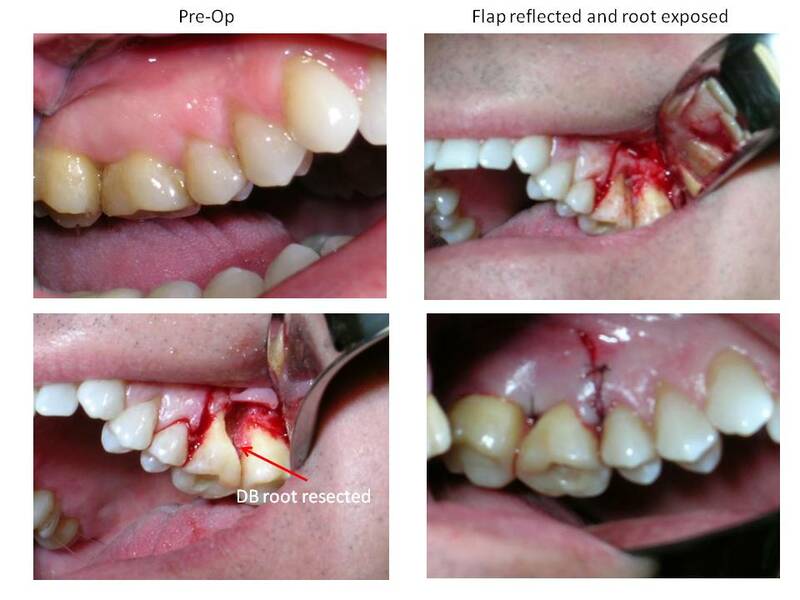 One week later, the patient was scheduled for the DB root resection. 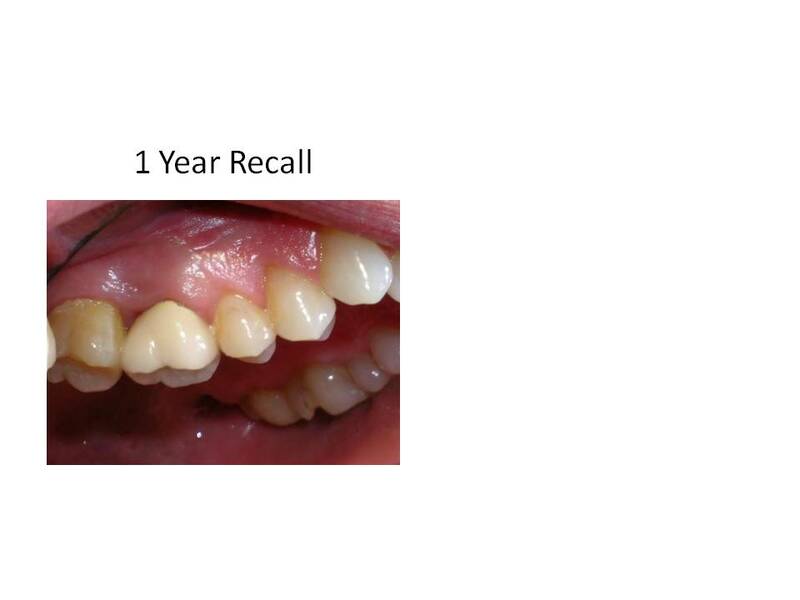 Sutures were removed after three days and the patient was scheduled for a recall in 1 year. He returned for the recall appointment (fortunately!) and he was found to be asymptomatic. Periodontal probing depths were WNL and the gingival tissues appeared healthy. There was restablishment of the lamina dura associated with the DB root. The RL lesions on the P and MB roots had decreased in size however,they have not totally resolved. Here are the recall images. I welcome any questions or comments. Thank you for allowing us to take care of your valued patients. This months case is a challenging one. Patient is a 56 y.o female who presents with the CC of pain tooth #18 for the past 2 weeks. She has been taking Vicodin at night to help her sleep. Her medical history had positive entries for an allergy to sulfa drugs and sensitivity to codeine (elevated heart rate). She has acid reflux (Prevacid) and elevated BP (Lisinopril). 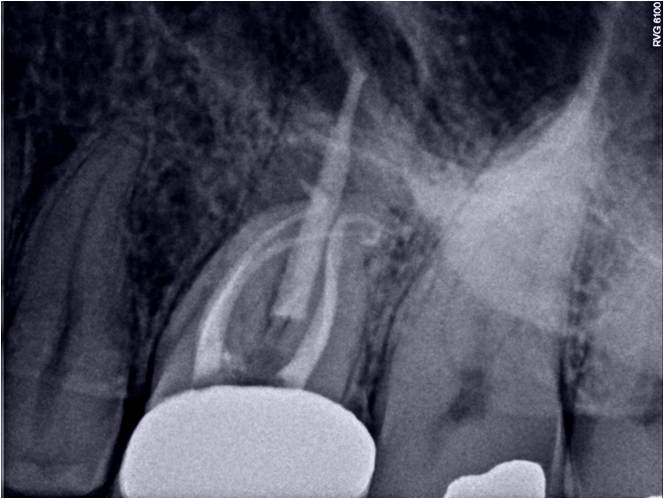 Dental exam reveals that tooth #18 had root canal treatment 1 year ago by an endodontist. Tooth was accessed through an existing crn. 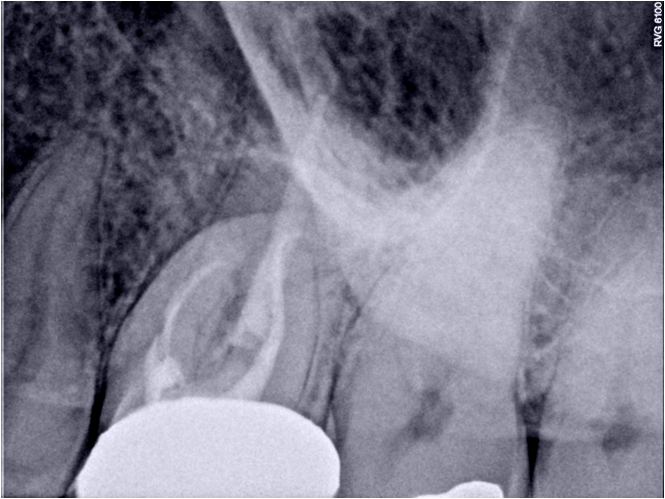 Clinically tooth #18 is tender to percussion, probing depths are WNL, FGC crn present. 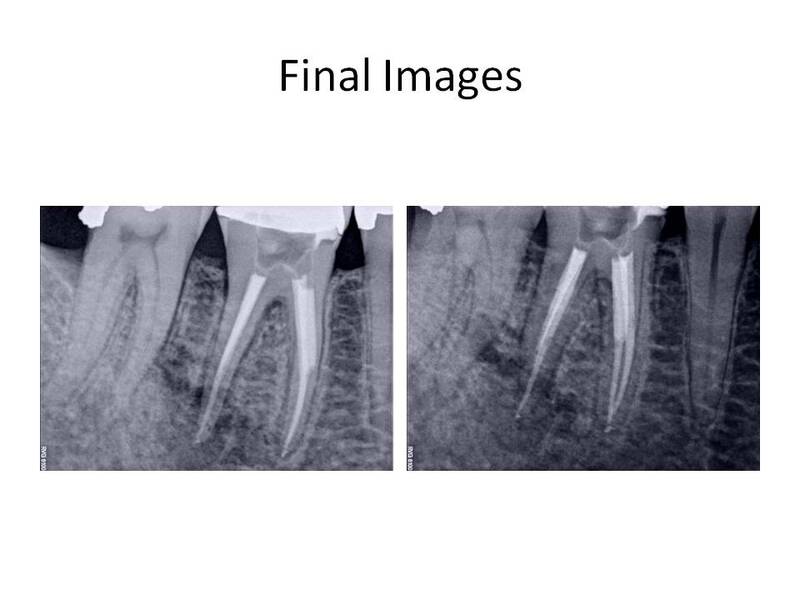 Radiographs reveal: Previous RCT #18,19. 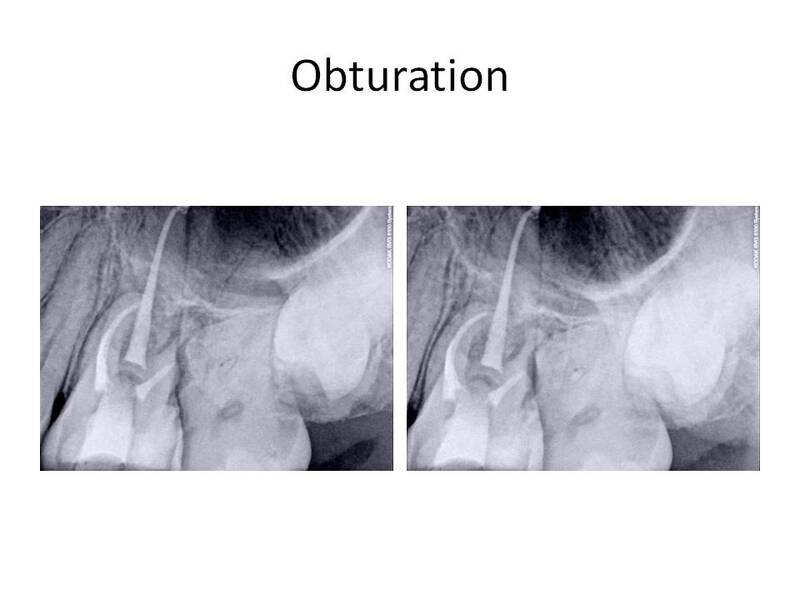 Obturation #18 is overextended by approximately 3mm distal root and 1-2mm mesial root. 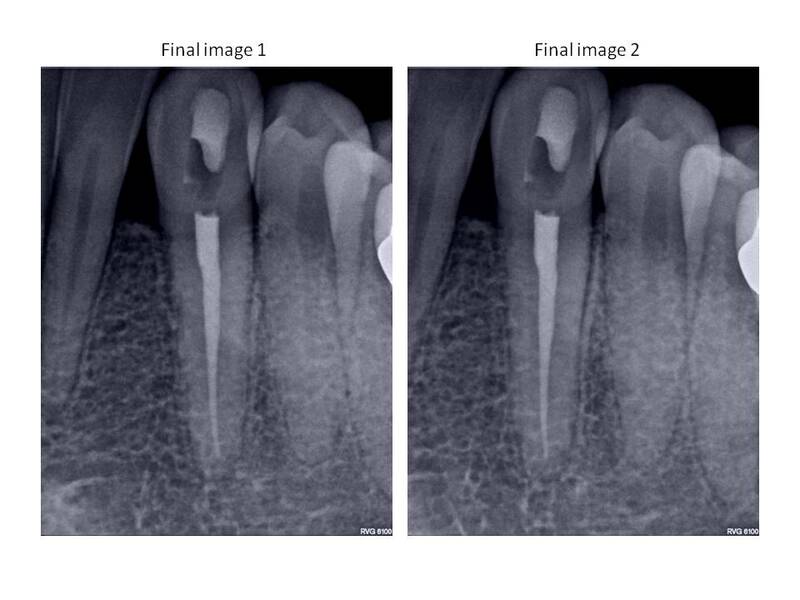 Tooth #18 canals have been coronally overprepared with thin remaining root structure. 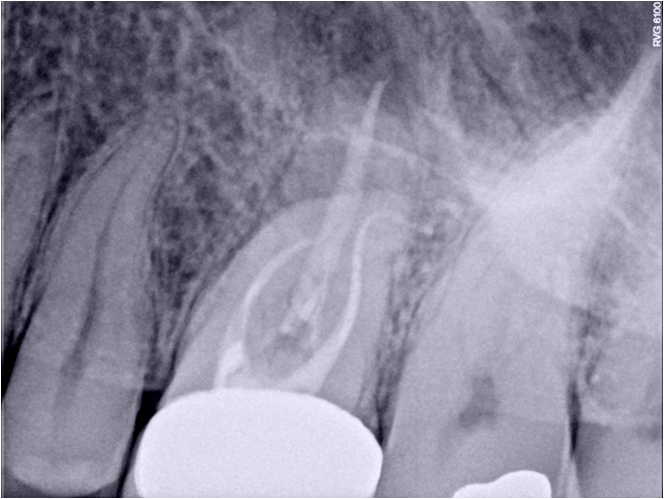 Tooth #19 also has had RCT with a short obturation present and fractured instrument in the ML canal. Cone fit of MB canal also demonstrates inadequate fitment. So, the case was obturated with MTA in both canals. 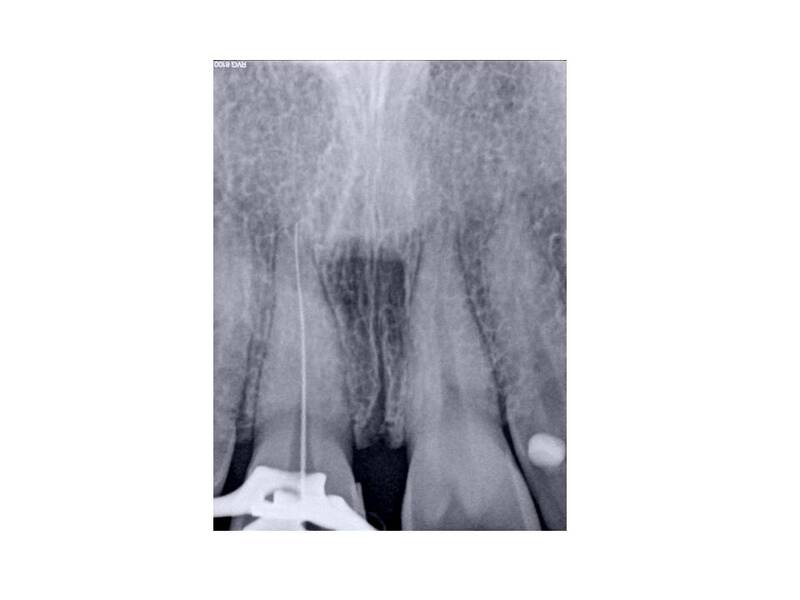 I obturated with GP over the MTA in the distal canal to allow for a post space to be created if the restoring dentist so desired to place a post. This case was also done in 2 appointments. When she returned for the obturation appointment, her symptoms had resolved and she no longer needed to take Vicodin to control her pain at night. 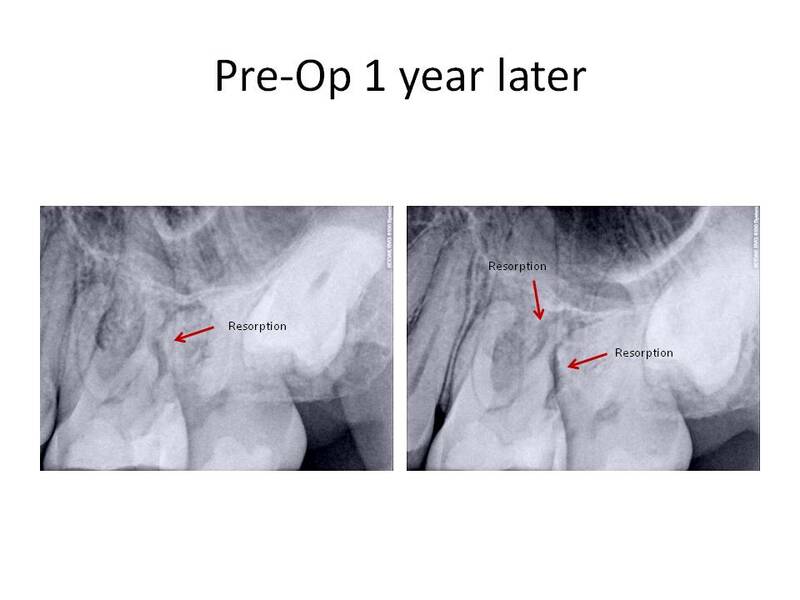 Cases like these are challenging because it is highly improbable to extract the overextended cone in 1 piece. 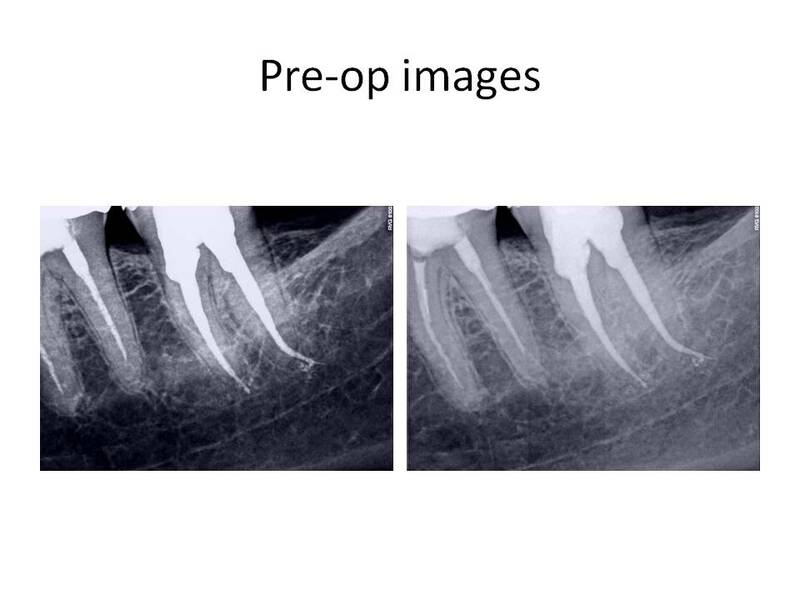 The trick to removal is to create a path along side the cone and progressively enlarge it slightly to allow the cone to pass through the root end. If not, the cone would break and retrieval would be impossible. Now, GP is an inert material, so why do these cases become symptomatic? If you can imagine that when the root end is overprepared, it goes from a round shape to a tear-drop shape. These results in an inadequate apical seal and residual bacteria continue to have a food supply. Also, I obturated with MTA due to the tearing of the foramen. I could not achieve an adequate seal with GP in this situation. Once again, thank you for your continued support of our practice. We want to be your first choice in endodontic care for your patient’s and strive to provide the best care available. Case 1: Patient is 28 y.o. female who presents with the Chief Complaint of discolored #8. Her medical and dental history were unremarkable. She had no history of trauma to her maxillary anteriors that she could recall. Clinical exam revealed discolored #8. Vitality tests were normal for teeth #7,9. Tooth #8 did not respond to thermal tests, had normal percussion and palpation, and her probing depths were WNL. She desired #8 to be “lightened” to match her adjacent teeth and did not desire to have a crown or veneer placed to mask the discoloration. Radiographs revealed #8 had undergone calcific metamorphosis. Periradicular tissues appeared WNL. 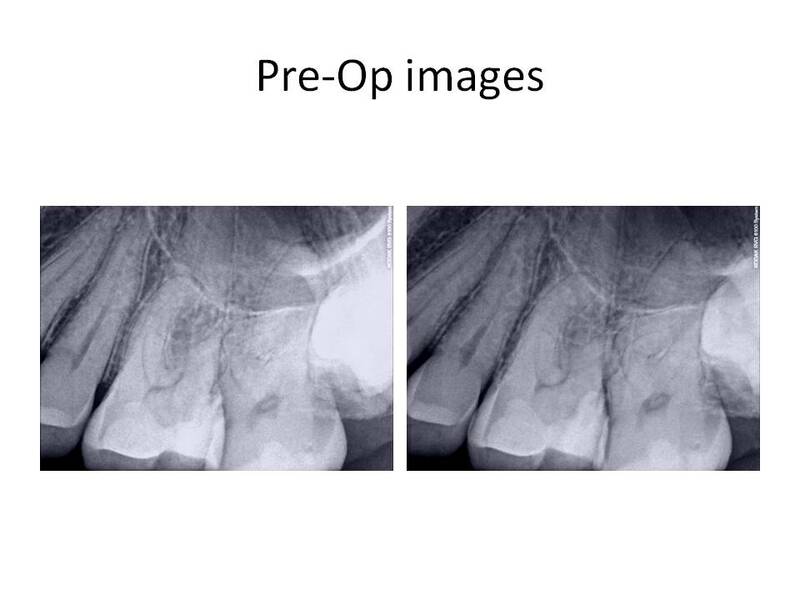 Pre-op images – the apparent canal line that is visible in the image is actually the sensor. Believe me, the canal was completely obliterated clinically. Case 2: Patient is 51 y.o. female who presented with the Chief Complaint of sensitivity to cold and tapping tooth #22. Her medical history was quite extensive with positive entries for Ehlers-Danlos, Medullary Sponge kidney, Sjogrens disease, Asthma, Insulin resistance, Polyclonal Hypogamma Globulinemia, Factor V leiden, sleep apnea, A-fib, Aortic Valve Prolapse, Breast Cx 11 years ago. Current medications included: Coumadin, Urocit (for kidney stones), Coreg, Cozaar, Lipitor, Celebrex, Celexa, Actos, Byetta, Growth hormone, Ultram. Clinical exam revealed discolored #22, no response to cold, slight percussion tenderness, negative palpation tenderness tooth #22. Adjacent teeth responded WNL to all pulp vitality tests. Patient has no restorations present on #22. She did undergo orthodontic therapy in her mid-40’s to upright and rotate #22 into its current location. 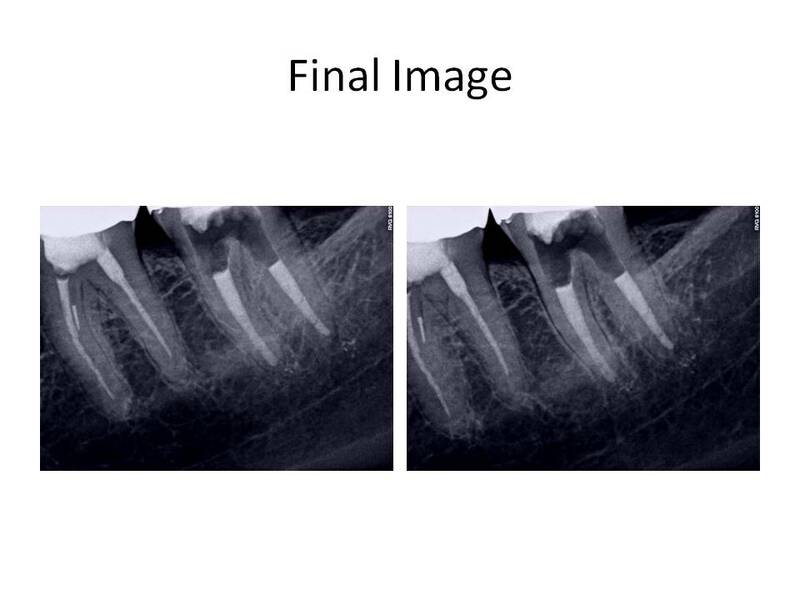 Radiographs revealed that the coronal 1/3 of the pulp chamber tooth #22 was patent, however, the remaining canal was completely obliterated radiographically. 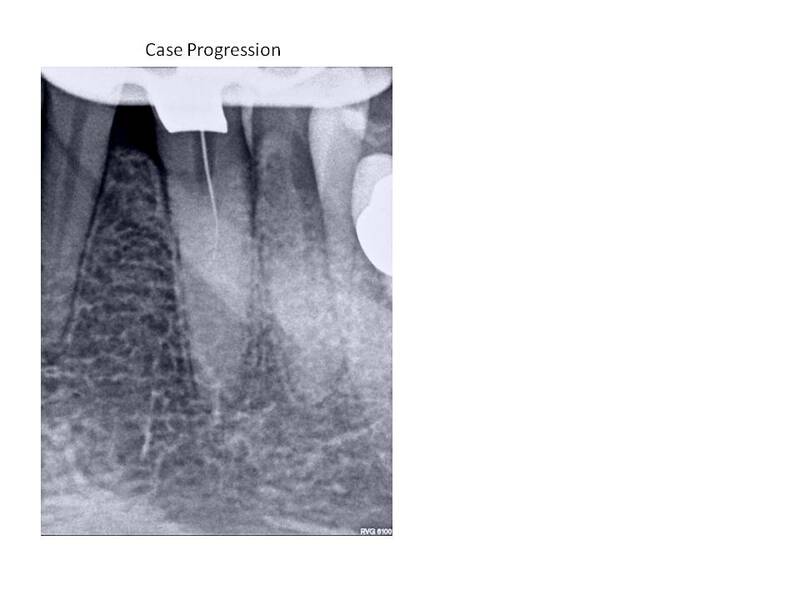 This was an unusual presentation due to the fact that teeth will undergo calcification from the coronal extent of the tooth and typically, the apex is somewhat more visible radiographically. I welcome any questions and/or comments. Thanks again for you continued confidence in my practice! Come back soon to read blog postings! Dr. Chris Ettrich graduated from The Ohio State University College of Dentistry in 1995. Following graduation, he served in the United States Air Force until 2006 During his military career, he completed a 1-year AEGD residency and practiced as a general dentist for seven years. From 2002 – 2004, he attended the University of Washington where he earned his endodontic certificate and masterâ€™s degree. From 2004 – 2006, he served as the Southern Endodontic Consultant for the Air Force, Chief of Endodontics and Department Head of Endodontic Section of AEGD program, Eglin Air Force Base, Florida. Hello again. My apologies for not keeping up with this Blog due to my injury. We are back to full speed now so here is May’s COTM. Patient is a 47 y.o male with CC of bump on his gums for several months. He is asymptomatic and pain is 0/10 currently. Medical history: He takes Tramadol and Darvocet for chronic back pain. Clinical exam reveals: Sinus tract stoma present facial to #12, PFM crns #13,14. Large restorations present #12,15. Pulp tests reveal: Normal response to cold #12(although slightly exaggerated, and #15. No response to cold #13,14. 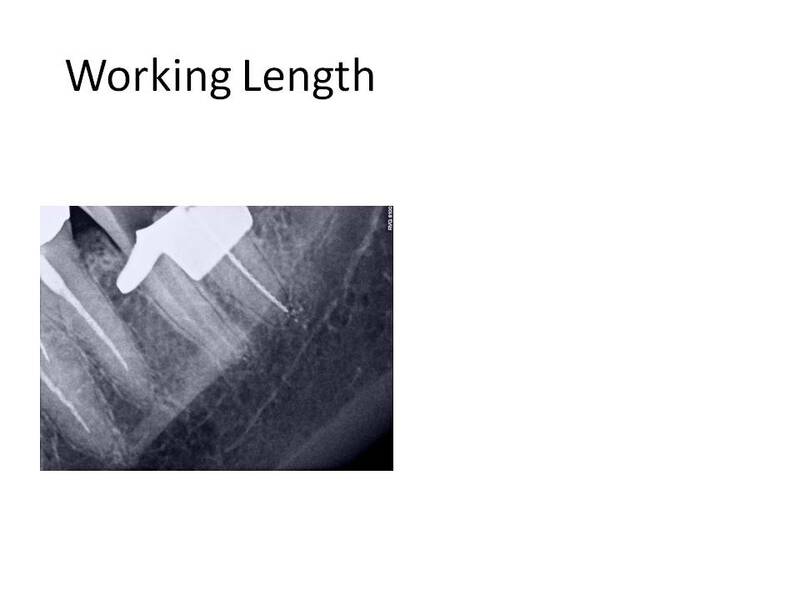 Radiographs reveal normal periradicular tissues #12,13. Diffuse RL lesion associated with the MB root #14. Previous RCT #13,14. Treatment options were discussed with patient including no treatment, extraction and prosthetic replacement, non-surgical retreatment, or surgical treatment. I recommended non-surgical retreatment of the case. Considerations for non-surgical retreatment included short obturation of MB, Palatal and DB canals which were probably blocked with dentinal debris from previous treatment, curved mesial root which could also be perforated or canal transported while trying to instrument canal to length, and fracture of porcelain crn. 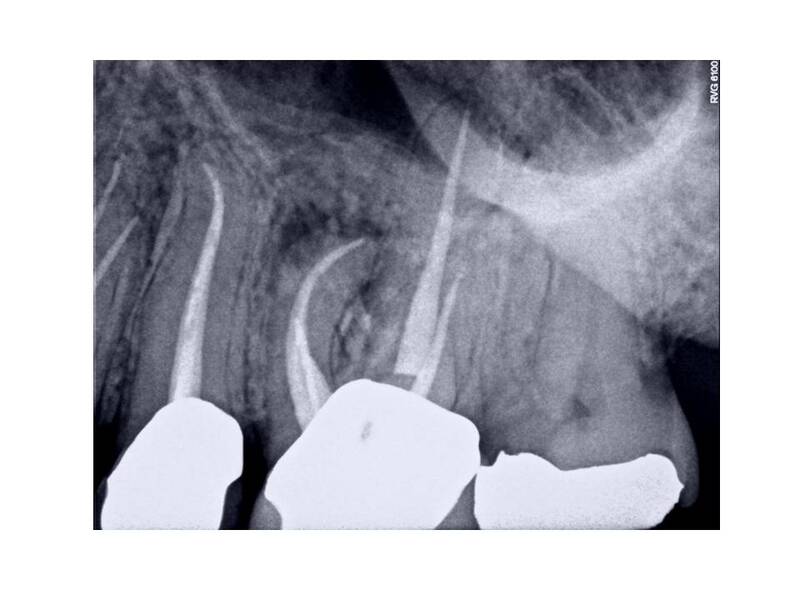 Here is the result from the retreatment: Due to the complexity of the case. Treatment was performed in 2 appointments. As some of you may have noticed, RCT was done #12 in the interim as well. This is because the patient returned with moderate pain. Remember, that from the initial exam he had a slightly exaggerated response to cold. It turns out that this tooth underwent irreversible pulpitis in between the appointments for #14. Patient presents for evaluation tooth #14. Currently asymptomatic. Exam reveals: PFM crn present #14, margins are well adapted and crn is in good condition clinically. 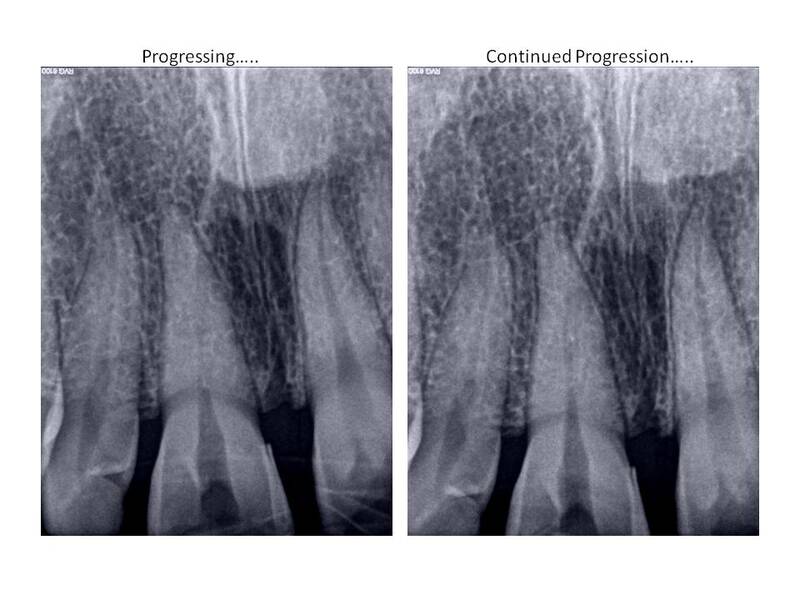 Patient has had history of root canal therapy 2-3 years ago by an endodontic specialist. Patient was referred by his new dentist because of noted pathosis apical to #14. Radiographs reveal: Diffuse Radiolucent lesions present both Palatal and MB roots. 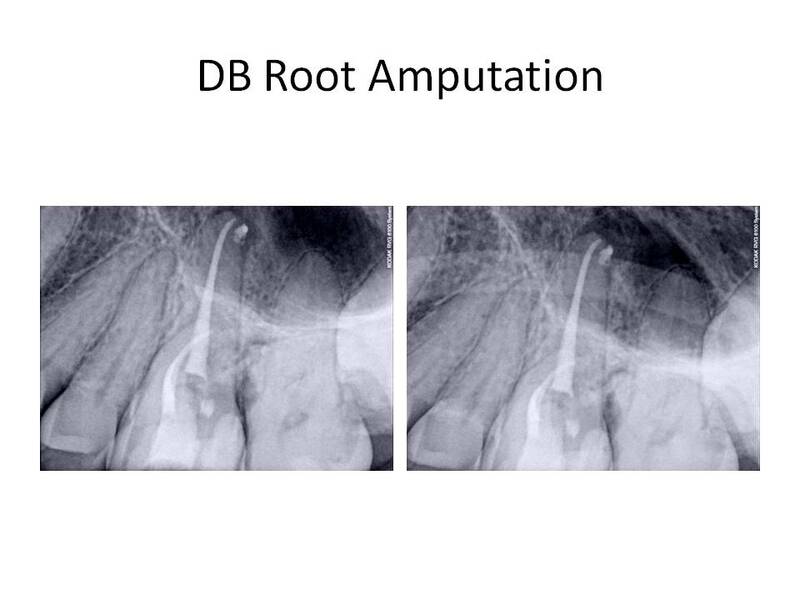 DB root has severe dilaceration in the apical 1/3 of the root. 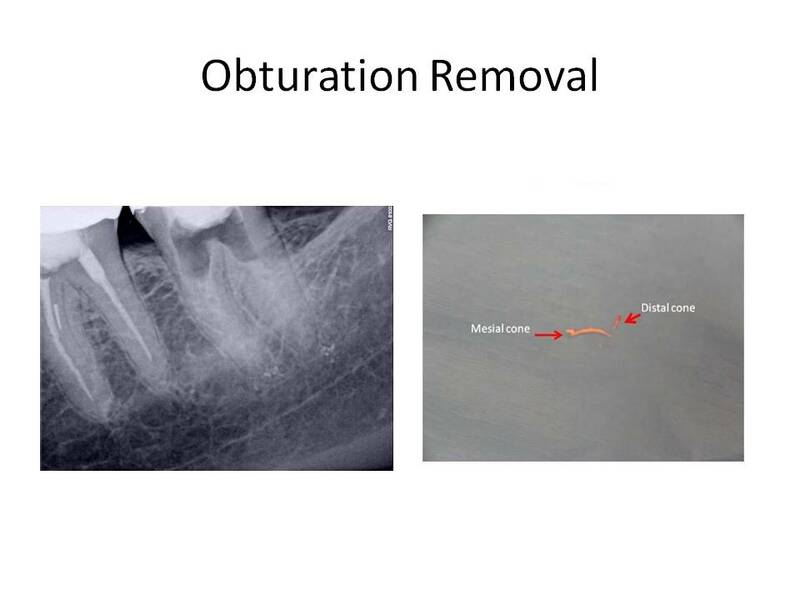 Mesial root has been instrumented and obturated well short of the radiographic apex. 1) No treatment. Patient is asymptomatic. 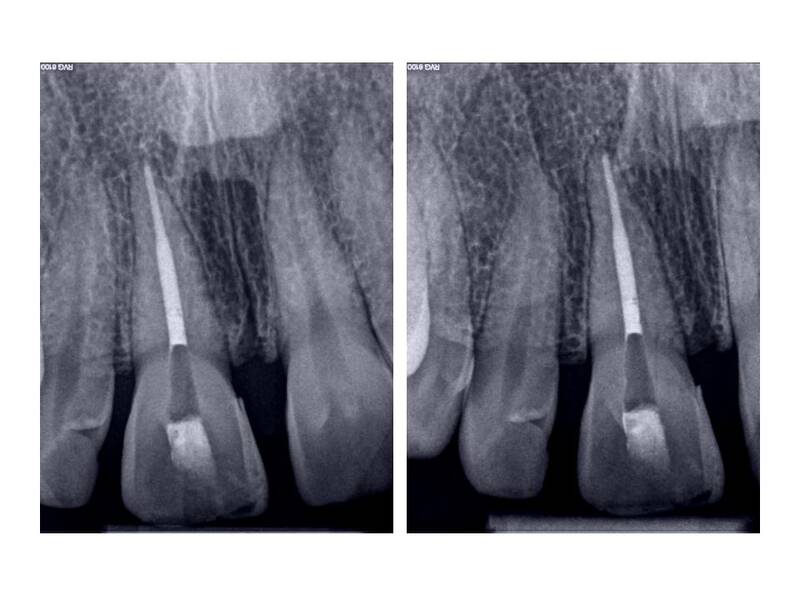 2) Nonsurgical retreatment – although the treatment was performed by a specialist initially and the likelihood of instrumenting the mesial canal to length is questionable. 3) Apicoectomy – this treatment option would address the mesial root shortcomings and not affect the crown; however, it would not correct the apical pathosis associated with the Palatal root. Discussed tx options with the patient and he decided to have the non-surgical retreatment performed before his tooth became symptomatic. I welcome all comments or questions regarding this case. Thank you for your continued confidence in our practice.